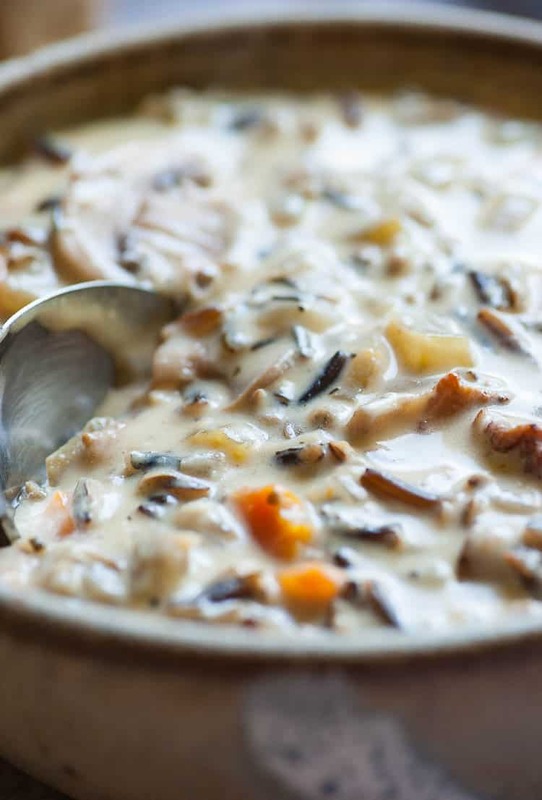 Instant pot mushroom vegetable wild rice soup is a hearty, tasty dinner that cooks itself in your pressure cooker. MaryJo and I are back up in Minnesota for the summer and Minnesota is the home of wild rice, (along with Canada which has a lot of wild rice). It is something that is sometimes hard to find in certain parts of the country but worth the effort to get ahold of some. Most of the wild rice found in stores is farmed and cultivated to get the most yield year after year. It has a hard, black outer sheath and requires plenty of cooking time…like 1 hour or more, to make it soft. If you can find the “real,” hand harvested wild rice, it has a much softer sheath and is brown in color. 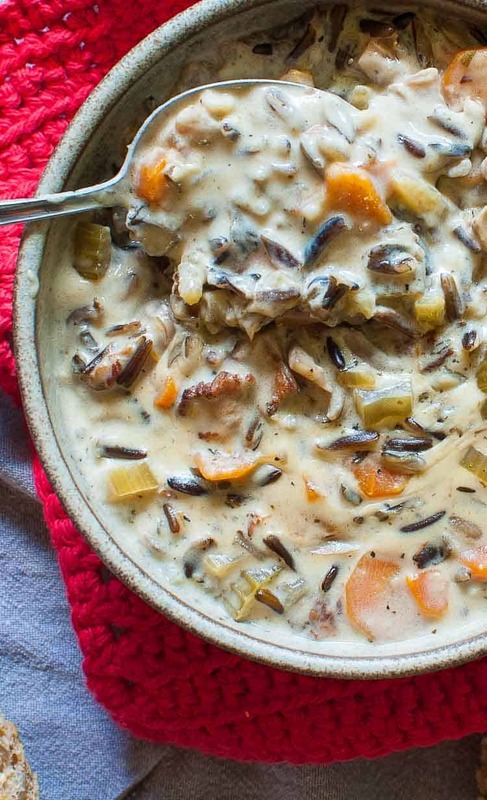 This wild rice takes 15 minutes to cook. Big difference. 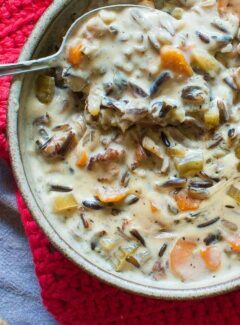 I did another wild rice recipe, Creamy Ham Wild Rice Soup, where you can find lots more interesting facts about wild rice. This recipe calls for the cultivated rice, since it’s most prevalent. It cooks beautifully in your pressure cooker and in 45 minutes it will be soft and savory good. And I know you won’t tell anyone, but there are a couple strips of chopped up, crispy bacon strips in this soup…just to give a little extra umami, which is rich, wholesome flavoring. 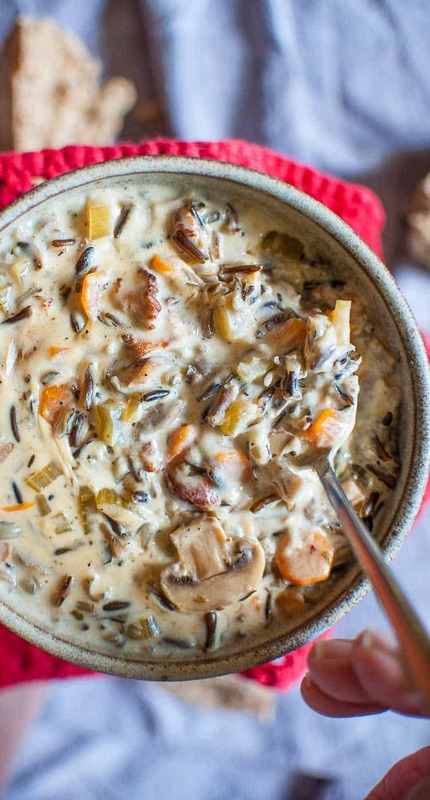 You should serve this mushroom vegetable wild rice soup with some crusty bread for an exceptional dinner. This is a flavorful soup recipe sure to be a crowd pleaser. Add all the ingredients, (except the butter, flour, milk, and extra salt and pepper) to the Instant pot and stir to combine. Select pressure cook, high pressure and set the timer for 45 minutes. Do a quick release of pressure and remove lid. Next, select saute, add the butter and stir to melt. Add the flour and let cook for 2 minutes. Add the milk and stir. Bring to a boil then turn off the Instant pot. Taste and adjust seasonings. If the soup seems too thick, add some additional vegetable broth to thin it out. this sounds absolutely delicious! but i don’t have an instant pot…how would i, and could i, cook this on the stove, in a regular pot, or in a crock pot? Hi Kelly, Put everything except the butter, flour, milk, and extra salt and pepper, into a large pot or dutch oven. Simmer for up to 1 1/2 hours checking the rice for tenderness after one hour. When the rice isn’t chewy, it’s done. Then proceed to thicken the soup per instructions. Thanks for the comment. thanks, Joe! keep up the delicious recipes! !